Susan Crump McArn, a powerhouse of a woman, mother of four, fearless in pursuing her goals, a designer of three homes and meticulous overseer of their general contractors, Medical Operations Manager for her husband and lifelong partner, Dr. Hugh M. McArn, Jr., passed away in her sleep on the evening of January 15, 2019. She was born Mary Susan Crump on October 5, 1924 to Lois Rhodes Crump and Walter Thaddeus Crump of Wagram, NC. Her story isone of happiness through hard work and fulfillment arising from the bitter ashes of some dark tragedies and the bright light of family commitment to one another. It’s a story with origins in two locations: Mt. Elon Baptist Church in Lydia, SC in Darlington County, where the Rhodes family was located, and a little community near Ellerbe, NC, which served as the center for a large part of the Crump family. Mt. Elon Baptist Church, established in 1831, and was led by newly ordained pastor John Hicks, born in 1782. Six years later his daughter Elizabeth married a young man named Caleb Beck Rhodes who would serve as a lieutenant in the Confederate army. The coming war would create casualties of two of their sons, both lieutenants like their dad, in the Battle of Seven Pines in Malvern, VA, May 31 – June 1, 1862. A later son of Caleb Beck Rhodes, was Caleb Bealer Rhodes, Mary Susan’s grandfather, born too late (1854) to get killed in the Civil War. He was a man who understood the important opportunity of education. He met a woman six years his senior and married her on December 28, 1885. Less than a year later, at the age of 38 Jennette bore the first of her three “L” Rhodes girls: Lois Blankenship (Mary Susan’s mother), Lucille Elizabeth, andLattie Susan. When the oldest, Lois, was 14, the family moved to Raeford, for one reason only: so the girls could attend Raeford Academy. When they had all graduated from Raeford Academy, they went on to study at a college which would come to hold a special place in the life of the Rhodes/ Crump clan: Meredith College. None of the “L” Rhodes women graduated from Meredith, but they and their father paved the way for one who would. In 1910, when their youngest had finished at Raeford Academy, Caleb and Jennette left Raeford for St. Pauls, NC, but not before Lois had met a handsome young man working in the old Bank of Raeford, Walter Thaddeus Crump. WalterThaddeus was one of eleven children born to Walter Stephen Crump (1856-1939) and Roseanna Bowden (1856-1903.) Walter Stephen as a young man took on the position of overseer for Jeremiah Pines Ingramin Richmond Co, NC. Ingram’s wife was Mary Polly Crump, the half-sister of Walter Stephen Crump, who found him an overseer job on their plantation. While working there Walter Stephen met Roseanna on a neighboring farm, whom he married. Her father, Reddick Bowden, gave the newly-wed couple 325 acres one mile northwest of Covington, Richmond County, NC, where they built a log cabin and includes a Bowden Family cemetery, now called the Nicholas Cemetery.This served as the center of activity for the Crump family for many years, headed by Walter Thaddeus’ brother, “Uncle Jack.”Walter Thaddeus grew up on this farming ground near Ellerbe, NC and eventually took his fifth-grade education and his proficiency with numbers on the road, and found his way to Raeford, finding work in the old Bank of Raeford, soon after the turn of the twentieth century. When he married Lois Blankenship Rhodes on April 17, 1912 at Lois’s home in St. Pauls, they moved to a brand new place — Wagram — to begin their life together, with Walter Thaddeus working as a cashier of the newly organized Bank of Wagram for a number of years.The couple’s attempt at starting a family resultedtragically in two infant deaths. He established a mercantile business along with real estate venturesand cleared “blackbottom” land close by the Lumber River, using dynamite to eliminate the stumps.Walter Thaddeus built a house on the north side of Wagram close to the Lumber River (Drowning Creek.) In that house Susan was born in the middle (1924) with an older brother Thad (1917), and a younger brother Tom (1929.) They grew up swimming in the icy, black swirls of the Lumber River in the neighborhood that became known as “Crumptown” named for Walter Thaddeus and his development of that location. In 1916 Lois’ parents came to live with them: Jennett had taken ill and proved to be too much for Caleb to handle. The other two “L” Rhodes women were off on their own. Lucille had married Walter Hale Hamilton in 1909 who had taken her up to New Haven where he was a law professor. Lattie, or as Susan called her “Aunt Lat”was embarking on her working career which took her first to the recently formed Coker College as a bookkeeper and on July 17, 1920 started her life work as secretary to the third and fourth presidents of Meredith College. When Jennett died in 1918, Caleb stayed on with Walter Thaddeus and Lois and helped raise a new set of kids. When Mary Susan was seven years old, tragedy struck the Crump household. First her grandfather Caleb passed away in their home in the dead of winter at the age of 77. Secondly, their house burned to the ground one night as Susan’s brother Thad wheeled her away from the inferno in a wagon. They moved to a house directly beside the Spring Hill Baptist Church where the family worshipped their entire lives. Devastation would not leave the Crump-Rhodes family alone. On September 1, 1937 Lois’ sister Lucille, having suffered a divorce from Walter Hamilton who had run off with his secretary at Yale Law School, died from an overdose of sleeping pills in New York City. Her cremated remains were stored in an urn under the rose arbor at north end of Aunt Lat’s garden at Meredith College, and ultimately buried in the Spring Hill cemetery near Wagram. Then came 1938 which would change Susan’s life forever. The Great Depression had been raging for almost a decade,and it was already formulating within Susana waste-not, want-not attitude and a high octane work ethic. Walter Thaddeus had adapted, shifting to a logging business and renting out farm equipment to local farmers to help with their harvests, when — again in the dead of winter —hecontracted pneumonia and died suddenly. Mary Susan was thirteen years old. The young family moved in with the late Walter Thaddeus’ sister “Aunt Bess” and her husband Monroe McMillan in an upstairs apartment in their house situated behind the Montpelier Presbyterian Church in Wagram. Lois and her two children, Susan and Tom, who was eight years old at the time, had to regroup and recreate life in this new arrangement. Thad was in the Army, following some schooling at Oak Ridge Military Academy (in Guilford County) and UNC. To make ends meet, Lois was registered on November 5, 1938 with the state of North Carolina to open the Wagram Coffee Shop in Wagram, where the young Mary Susan found her first steady job, and worked everyday after school. In spite of these hardships, Mary Susan was living life as a teenage girl. In high school she showed her business acumen as the advertising manager for the school yearbook, which, in its “Ideal Girls” section, chose Mary Susan for her smile. Also in athletics, she played the position of forward, yes petite Mary Susan, the smallest kid on the team, a forward on the varsity basketball team. 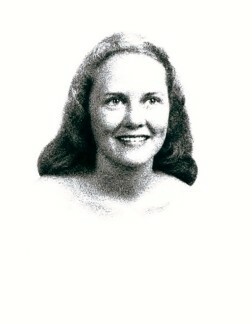 When she graduated in 1941 Aunt Lat had paved her way to enter into Meredith College now serving her second president at that college.Susan threw herself into her studies, and life at Meredith. She was Vice President of Student Government and a member of “Tomorrow’s Business Women.”She did three years of working through summer school and would continue to work at the Wagram Coffee Shop while on breaks from Meredith. The hard work of Lois and Susan for the Coffee Shop seemed to be paying off. For example, during the month of December, 1942, 425 persons were served in that shop for a revenue of $196.40 (over $1500 in 2019 currency. )Susan graduated from Meredith in three years in 1944, before her twentieth birthday,with a BA in Business Administration and a minor in Education.She immediately started work as a secretary at the Laurinburg-Maxton Airbasefor the final years of the war effort. Following the war, many things changed. Thad came home from the war and with his new wife, Esther McNeil — organist at Spring Hill Baptist, and piano teacher for many years —moved into a beautiful home just outside of Wagram on the Old Wire Road, less than a mile from the Spring Hill Cemetery where their father Walter Thaddeus and her aunt Lucille had been buried. Like his dad, Thad was involved in farming, logging and real estate. Brother Tom was off at Oak Ridge Military Academy. But it was not to be a love nest for the two newly-weds: Lois and Susan moved in from the McMillan house. Lois continued to run the coffee shop. Susan continued to commute into Laurinburg, beginning in 1946 to work as a legal secretary for Jennings King, an attorney in Laurinburg. She commuted into Laurinburg from Wagram with Lute Buie, Frances Campbell, and other friends in various automobiles, including a 1947 Plymouth Susan bought and later gave to her mother to drive. In 1946 Susan met Hugh McArn of Laurinburg, newly returned from the service in the Marine Corps in the South Pacific, at the Legion Drug Store soda fountain around the corner from the Jennings King law office in Laurinburg. She and a friend were approached by Hugh and Pemo Stewart, who reportedly said he was interested in “the little one.” But by the time the foursome got together that evening for a double date, Hugh managed to work his way into the heart of the beautiful and spunky working woman from Wagram. A seven-year long distance courtship ensued while Hugh went through Davidson College and Duke Medical School. Meanwhile life went on for Susan, continuing her legal work and supporting her mother and helping put her brother Tom through Catawba College where he graduated in 1951. Also in that year, more tragedy: Aunt Lat had a debilitating stroke during her duties at Meredith College, and was brought back to Wagram to join Thad & Esther, Lois & Susan in the Old Wire Road house where they cared for her the final five years of her life. In spite of her working to support and care for various family members with her boyfriend miles away, Susan still managed to sneak in some fun. There is a newspaper report of Chrysanthemum Tea at the Wagram at home of Mrs. W.G. Buie. ‘The Garden Hymn’ was sung to the tune of America the Beautiful. Miss Mary Susan Crump, dressed in an old fashioned costume, sang a pantomined ‘Old Fashioned Garden,’ followed by ‘Morning’ as encore. Mrs. W.T. Crump (Esther) was accompanist. Meanwhile her courtship with Hugh was deepening, with a long and increasingly involved correspondence which would begin with the words, “Dearest Quay…” Hugh’s childhood nickname. Susan would visit Hugh at Davidson, especially when Kappa Sigma was having big events, and stay with Mrs. Little, who had a close association with the fraternity. The correspondence continued when Hugh went on to Duke Medical School, and they made plans to get married upon his graduation. Susan ended her work with Jennings King, and Hugh graduated from Duke on March 20. On Saturday, March 21, 1953 at 8 pm at the Spring Hill Baptist Church in a highly formal affair, Susan and Hugh exchanged marriage vows, led by both Pastor Johnson of that church, and Pastor Fulton of the Laurinburg Presbyterian Church. The reception took place in the same McMillan home where Susan had lived in those Depression/ war years. That house had, two years prior to Susan’s wedding, seen the wedding of Bess and Monroe’s onlychild Anne who married Martin “Sonny” Laval McIntyre. Anne’s father Monroe was too sick to walk her down the aisle, so Bess’ brother Lamond Clyde Crump stood in for him. Within a few months, Anne was pregnant and gave birth to Martin, Jr.who was a one-year-old at the time of Susan and Hugh’s wedding. Five months after the McArn wedding, on August 16, 1953 Anne died of bulbar polio. Two days after that Bess’ husband passed away. MartinMcIntryre Sr. abruptly left to marry Joyce Brown in 1954, leaving Bess McMillan alone in the house that held the happy reception of the newlywed Susan and Hugh McArn, with the rearing of an eighteen-month-oldbaby. At the close of the McArn party in the McMillan house, the newlyweds packed up the Model T, took a weeklong honeymoon in Florida, and then moved to Richmond, VA, where Hugh was starting a medical residency. Michael Rhodes McArn was born in Richmond in May, 1955, and the couple started shopping around for a location for Hugh’s medical practice and a place to raise their new family. They moved to 703 Anson Avenue in Laurinburg and on July 11, 1955, Hugh moved into a new practice with Davidson classmate Murdoch McKeithan in the building next to Everington’s Drugstore downtown Laurinburg on Main Street, not far from the railroad tracks. Susan was busy with young Michael, and a second son, Jeffrey, who would come along after celebrating two years of establishing his practice. In 1957 Susan’s mother Lois, still living with Thad and Esther in the Old Wire home, fell and broke her hip. Her recovery required more care than the two could give, so Susan made up her a room in the small Anson Avenue place. She would live with the young family — just as Susan’s family had taken in her grandfather, and her Aunt Lat — until she died of a stroke in 1960. When Hugh’s medical partner left to go into Obstetrics, Hugh marshalled on with his practice alone for the rest of his career. In 1963 with two daughters on board — Hope being born in March, 1959, and Meg in November, 1961 — Hugh built a new medical office on King Street where he would practice medicine for the rest of his career. In 1961 another personal disaster in the long line of such for Susan: her older brother, veteran of the Battle of the Bulge, died suddenly in Wagram, leaving his wife Esther all alone in that big old house. Grace Rhodes Niven, widow of Frank Niven who had been on her own since 1950, came to live with Esther and received frequent visits from Susan and her kids. As her kids grew up, with the dedicated help of Eloise Revels, hired to help with raising the kids and managing the household, and loved as a member of the family, Susan was increasingly involved in the management of the medical practice, until the kids were grown enough for her to take over the front office entirely, and filing the taxes and processing insurance claims, and receiving and prepping patients far longer into the night typically than the head physician desired. In the mid-1960s Susan began her first building design project: the house at 501 Wilkinson Drive. She would tear out pages from architectural, design and fashion magazines with ideas that fit her well-defined aesthetic, with an eye to making this a house worthy of her efforts. Working closely first with architect Sam Snowden, and then with the contractors and builders, right down to the paint crew, Susan McArn drove the project to its excellent conclusion — an amazing house to grow up in. In that house we kids learned various things from our mother. Chores. Don’t throw things away that could be used for something, like food that might possibly be eaten another time. Piano lessons are good for you. Visit and receive visits from your family. She hosted many a family gathering over holiday and other meals, with long conversations around the table, with almost as much attention to food creation as to table place settings decorum. She introduced us to the concept of visiting the sick and the shut-in: we were part of regular visits to Bess McMillan, Grace Niven, Esther Crump, and Hugh McArn, Sr. all as they faced their final years in institutional settings. His wife, Hugh’s mother, came to live at 501 Wilkinson Drive leading up to her final days in 1979. Tennis was part of the family life, playing as a family, and with our good friends Charlie and Ann Hostetler from Raeford with whom Susan and Hugh would get together often for a tennis workout followed by some entertaining food and stories. She had her own health scares: a tumble down a set of stairs from an office building on Roper Street in Laurinburg which resulted in a broken elbow, a cyst the size of a small football which had wrapped itself around her spleen — but thankfully benign, a problem with one ear, resulting in reduced hearing all her life. She was an involved member of her various communities: faithful to the Laurinburg Presbyterian Church, a leader of scouts for her kids, active participation in the Scotland High School Band Booster driving the fundraising campaign which supported new band kilt uniforms for the band, and passionate about issues of public concern around town. As Hugh’s medical practice wound down for both Hugh and Susan, ending on July 11, 2000 — exactly 45 years after it had begun — and their grandparenting requirements were on the rise for their six grandchildren, they began anticipating retirement and its needs. And so the third building project came onto the drawing board. This one was to top them all. Primary requirement: a 30-foot indoor exercise pool in the middle of the house. Architect after architect, including Susan’s friend Sam Snowden, refused to work with such a plan. So she kept pushing and searching. Finally, in Wilmington, NC she found the architect who would work with her design, and find a reasonable way to execute her vision. And so was born the “Taj McArn” with a glass roof over the exercise pool on a single level with rooms for each of the four kids for regular gatherings, and a separate entry apartment for Michael, and a workshop for Hugh. It was in this house of her own making that Susan spent her final years, with her son Michael and his wife Delilah providing her with devoted care. Susan McArn is predeceased by her husband Hugh who passed away in his sleep in that Susan-designed house, on August 4, 2015, and by her brothers Thad (May 4, 1961) and Tom (Oct. 23, 2012.) She is survived by her sons Michael (Delilah) and Jeffrey (Georgia Frank) and her daughters Hope (Randle Weeks) and Meg (Ken Clunan)and her six grandchildren — Maddy, Halley and Theo McArn, Covey and Thomas Clunan, and John Weeks, all of whom are grateful for her tenacious love, as well as in awe of her confidence in herself, her transcendent commitment to family, and her indefatigable vision for, and execution of, the many purposes which gave her life its fullness. Even though resting was a foreign concept to her in life, in death, may she find the peace that passes all our understanding. A service of Thanksgiving for the Life of Susan McArn will be held at 3:00 p.m. Sunday, January 20, 2019 at the Laurinburg Presbyterian Church. Visitation for family and friends will follow in the church fellowship hall.